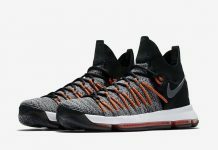 The Nike KD 9 Elite Time to Shine is part of a collection from Nike Basketball’s for March Madness that consists of the Nike Kyrie 3 and Nike PG 1 – already released. Dressed in a Dark Grey, Sail, and Hyper Jade color scheme. The Elite-version of the Nike KD 9 is highlighted by a shiny iridescent finish on the Nike Swoosh logo. Featuring a one-piece stretch collar that replaces the Flyknit that was originally used on that area. It also comes with thicker Flywire cables to add for a better lockdown fit. But Nike kept its original full-length visible Zoom unit that’s seen on the non-Elite KD 9. Look for the Nike KD 9 Elite “Time to Shine” to debut overseas on March 16th, followed by a stateside release on March 24th.